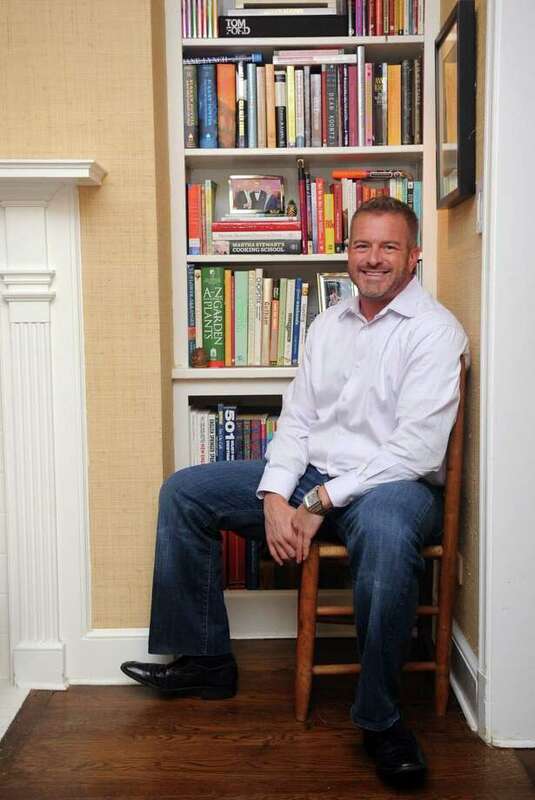 Christopher Spiegelman poses for a photo in his North Stamford home on Friday, July 20, 2012. Spiegelman was a boy scout for eight years. Christopher Spiegelman was a Boy Scout for eight years, and while he enjoyed his time with the organization, he is baffled by its decision last week to reaffirm its ban on gays. "Whether you're gay or straight, I don't see what that has to do with tying a square knot," said Spiegelman, a managing director of WTAS, a tax firm in Greenwich, who came out a few years after leaving the Boy Scouts. Spiegelman, 43, president of the Triangle Community Center, a nonprofit advocacy and service group for lesbian, gay, bisexual and transgender people in Norwalk, said the policy was just another version of the military's former "Don't Ask, Don't Tell" policy. "It's a sheep in wolves' clothing," he said. "Don't Ask, Don't Tell doesn't work in the military, and it doesn't work in Scouts." He said local Boy Scout chapters should be teaching tolerance and equality, not discriminatory practices. The Boy Scouts announced Tuesday after an internal review that it was upholding its policy of barring openly gay boys from membership and gay or lesbian adults from serving as leaders. Kevin Bishop, CEO for the Housatonic Council of the Boy Scouts of America in Derby, said anyone who is behaving appropriately -- gay or straight -- is welcome to become a member of the organization, which does not proactively inquire about the sexual orientation of its employees, volunteers or members. But Spiegelman said he would not encourage any boy who questions his sexuality to participate in the organization because it could be harmful to his self esteem. Dustin Shaver, a CEO of the Connecticut Yankee Council of the Boys Scouts of America in Milford, said the policy has more to do with acting appropriately and discussing topics that are suitable. "We don't talk about sexuality," he said. Shaver said he understands Spiegelman's position, but wants to follow the Boy Scouts policy. Onte Johnson, 28, of Bridgeport, who worked as a community organizer for the Boy Scouts, said boys benefit tremendously from being Scouts, but he'd like to see the organization become more inclusive. He said he was told by leaders of the organization when he learned of the ban that it was to protect children from predators. But he said keeping gay people out of the organization doesn't prevent children from being abused. Children have been abused by priests and respected leaders, such as Penn State University's Jerry Sandusky, a retired football coach and convicted child molester. Johnson said the Boy Scouts' background check program is the key to catching predators, not banning people based on their sexuality.